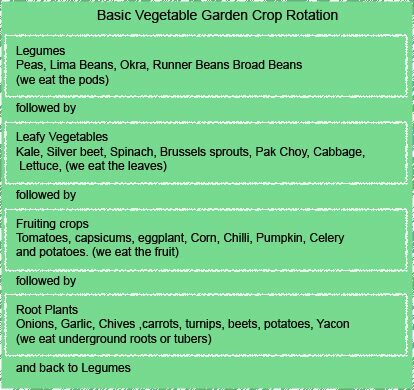 Crop rotation in the vegetable garden is an important aspect of plant health, it differs from companion planting. This is nothing new, gardeners have been using the practice for centuries. The basic of rotation planting revolve around sequencing planting over a 4 year period. This means that plants are grouped together in four groups Legumes. Root Vegetables, Leafy Greens and Fruit bearing Plants. Each year the group is shifted on to the next plot. Related plants such as tomato and potato also do not follow each other. So if you divide you veggie garden into four sections you are ready to start rotating crops. Potatoes are in the same family as tomatoes, so potatoes should not follow tomatoes (use a different bed). 3 year charts and 4 year charts are both put forward, and different ideas as to what should follow what are also plentiful.